The Washington Lady Blue Lion volleyball team played its first-ever match in the new Frontier Athletic Conference Tuesday, Aug. 29 against the Hillsboro Lady Indians. Washington won both the varsity and j-v matches. In the varsity match, Washington won, 26-24, 25-8 and 25-14. Faith Kobel had eight kills in 14 attempts. Hannah Haithcock had five kills in 17 attempts and Halli Wall had four kills out of seven attempts. Delaney Greer had nine digs, Haithcock had six digs and Tabby Woods had five digs. Rayanna Burns, Haithcock and Maddie Jenkins each had three ace serves. In setting, Wall had eight assists on 50 attempts. Washington is now 2-2 overall, 1-0 in FAC. “We started off very slow and not aggressive,” Washington head coach Ashley DeAtley said. “We let them attack at us, but never really executed many plays to get a solid offense going. The Lady Lions will play at Chillicothe Thursday. 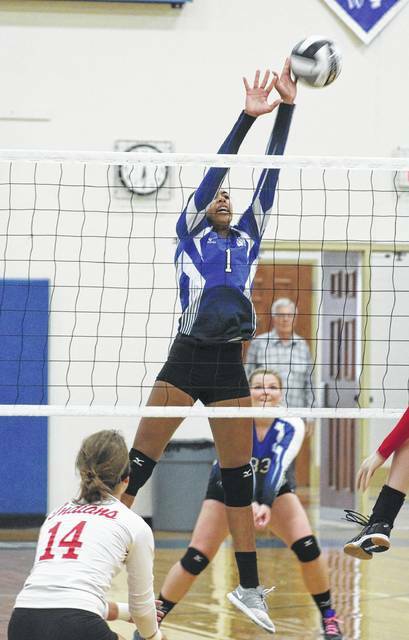 In the j-v match, Washington prevailed, 25-9 and 25-18. For Washington, in attacks, Brittney Wilson was 7 of 7 with two kills; Amya Haithcock was 4 of 8 with four kills and Rachel Palmer was 4 of 4 with three kills. Wilson was 11 of 12 passing; Emily Semler was 7 of 9 passing and Kara Vohra was 6 of 8 passing. Serving, Mallory Hicks was 14 of 15 with 11 aces; Semler was 11 of 11 with two aces and Haithcock was 4 of 5 with two aces. In setting, Emma Funari was 24 of 24 with six assists. Washington’s j-v team is currently 3-1 overall, 1-0 in the FAC. Washington’s Rayana Burns blocks at the net during a Frontier Athletic Conference match against Hillsboro Tuesday, Aug. 29, 2017 at Washington High School. Also pictured for Washington is Delaney Greer.